Welcome to the Our Daily Bread Designs January Release Blog Hop! If you arrived here from Dawn's Blog, you are in the right place, if not, you might want to start at the ODBD Blog, and hop from there. Be sure to leave comments along the way for your chance to win one of the FOUR fabulous prizes! The Hop will run from 8am EST January 1 through 8pm EST January 2. The winners will be announced on the ODBD Blog on January 3. I created a Tri Shutter Card using images and sentiments from Our Daily Bread Designs new January Release set called Special Boy. Isn't this set great for kids cards! I can see so many cool Birthday Invites, Treat Bags and so much more being created with this set! Even though I now have "big boys" they still have a love for monster trucks, so I'll be using this set for their cards too! To create the fun Tri Shutter Card, I used the Funhouse Birthday Card from SVG Cuts Summer Street Carnival SVG Kit, cutting all pieces with the Silhouette Cameo. 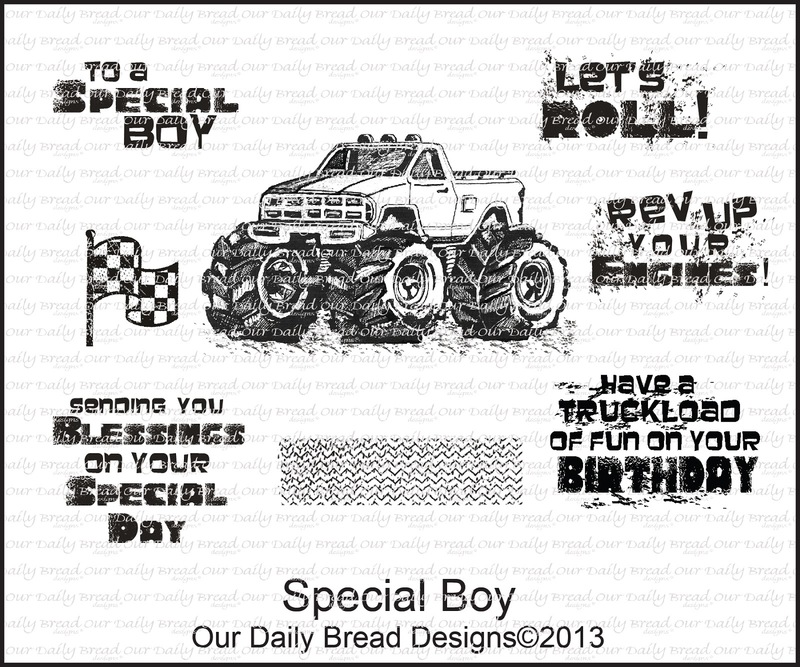 The Monster Truck, sentiments and flag are all stamped in Black Archival on Watercolor paper. The truck is colored with STAEDTLER Karat Aquarell WC Pencils, blending the color with Gamsol. To add a bit of texture, I embossed all pattern paper panels with the Tim Holtz Alterations Diamond Plate Embossing Folder, then lightly sponged over the embossing with Chocolate ink. Of course when I showed it to DH it he told me I should have made the pennant banner Checkered Flags! Thanks so much for stopping by, your next stop on the hop is Michelle's Blog! This is amazing Lisa! I think big "girls" will like this too! Praying for a wonderful New Year for you and yours! This is great. I really like this set and am in awe of what you've made with it. This is phenomenal Lisa!!!! Love it!!! Happy New Year! Gorgeous and so creative Lisa!! Love your use of the flags and your tri-shutter design!! Great choice of colors and design!! Happy New Year!! May you have a great day with family and friends!! The perfect card style for all these awesome images and sentiments Lisa!!! Love the additional banner and the flags! I've been wishing I had this ef ever since I saw this set... it's perfect! Perfection Lisa!!! What an awesome guy birthday card!! I need that diamond plate ef!! Love this!!! Amazing card! What boy would not love it?? This is a definite WOW! Love it! What a wonderful card for a young man. Great to see. Cool card--I like the banner. Any little boy who receives this awesome card will truly cherish it - it's so colourful & fun. Fabulous tri-fold card! This card is awesome, a keepsake for sure. Can think of ideas for girls in this redneck state of Vermont that I live in. Thanks for sharing your lovely creations with us! Love the tri shutter card. The items for boy cards are so welcome! This is so much fun! Beautiful card. Great for boys of any age - thanks! I love the bold colors. Love your card. I think even the "BIG" boys would like this. I really like the tri-shutter card, you can use so many great DSP's and embossing folders, Happy New Year! WOW! I can't imagine any boy not loving this card! It is amazing! Wow is right. Awesome card for a boy. Awesomne card. Love the colors, the flags on top. Gorgeous! Wow, what an awesome job. I love the flag banners you added. You did a great job with this style of card and the stamp too of course. I'm enjoying your Tri Shutter Card very much. While checkerboard flags would work, I seem to like your choices better! Happy and Healthly New Year to you and your dear DH! What a cool card! It certainly has the feel of being at a Monster Truck event! Great masculine card. Love that it's a tri-fold. I love shutter cards and this one is spectacular. All the added goodies on the top and I love the string of pennants. Really fun and creative. I love that type of card but you took it to a whole new level... Great job! Wow...that is an amazing card! Thanks for sharing! Blessed New Year! Oh My! What an amazing card! That sure would delight any little boy! A Happy New Year'2013 to you. Terrific card. It is delightful to think of a little boy opening this card. not only would the fabulous images catch his imagination, but I can see how a little boy would be fascinated with the "engineering' of this amazing creation. Thanks for sharing. Really neat card. Happy New Year! What an amazing card! Love the gorgeous design, so many beautiful details! Happy New Year! This is so perfect for a little boy! Think it might be beyond my abilities, though. But, it's a new year, time to try new things! Oh my goodness...this is a fantastic card. The stamps are great but the file to cut the card itself is wonderful! thanks for sharing with us. Amazing card!! Love all the little flags & banners! Perfect stamp set for the tri shutter card. Loved the colors. This card is cool for a boy any age! I don't think it's too childish! Super cool, Lis!!! Very cool, Lisa! Love all the details in your wonderful tri shutter card. Great colors and love the flags on top. When I saw this card I knew that I had to get this set. I have so many guys in my family, hubby, 3 sons, 2 grand. I don't know what happen to the girls. No pink around this house. Just love the work you have done on this. Veyr nice I love what you have done with this card! Oh my goodness!!! What a delightful card! I would love love love to create this beautiful rendition of a sweet fella card! what a great guy card. they are so hard to find! i love the tri-fold shutter card, and yours is fabulous. Thanks for sharing and Happy New Year! what an Amazing card the Tri-fold is super cool. love the Truck Stamp ists Awesome. the attention to details is awesome. thanks for sharing this Unique card. Amazing card! The tri-fold is so wonderful for this set and I love the coloring on your truck. I love this stamp set and you did such a great project using it! I have never seen a tri-fold card with so many cool features. The Boy stamp set works so well with this. Wozers on this card Lisa!! its a winner for sure...can just see this truck over the line in the winners circle!! Awesome idea with the flags, love the fold!! Wowsers, what a great tri-shutter card, Lisa! Any little boy would love to receive this. I had to chuckle about your DH comment, sounds exactly like mine!! Neat card. So colorful. Love all the variety in the card. I can only think of one word...WOW! I love seeing boy cards. How did you get the flags on top of the card? Great card. TFS! Wowzers Lisa- Love everything about this cool project- Love the colors- love the images and love the flags and banners! Lisa, what boy would be excited to receive this card with all kinds of things going on-it's wonderful! Wow, awesome guy card. I am sure that took a lot of planning. Love the color combinations. Thanks for sharing. This is an amazing card Lisa! Just perfection! All the details are simply superb! That's a tri-shutter card to behold. WOW, incredible! Super tri-fold little guys card! Happy New Year. What a difficult card to make! Very beautiful! I just gasped when I saw this card as I know this took a lot of measuring and planning and work. I love the embossing image you put on every piece. Fabulous job again. Thank you for all your work for this blog hop. We all appreciate the chance to win something from ODBD because of your creativity. WOWZERS!! Lisa such a awesome tri-fold card fro the diamond plate embossed pieces to the oh so cute pennants just love your card. Lisa, you are da-bomb!!! LOVE this so much!!! Very cool details and I love the fun papers and embossing!!! Happy New Year!!! HUGS!!! This is wonderul! I haven't tried the Tri-Shutter yet, thank you for sharing! OH MY!!!!!!!!!!! I can not stand how perfect this is!! Just perfect. I am in awe. i haven't tried the tri-shutter card in a while. i'll have to give it a go again. your card is great. Brilliant that you used that set in a tri-shutter!! It totally works!! Way to go Lisa!! Lisa, WOW WOW and WOW again. What a cool card. I am a grown lady and I love this card. This card has cool colors and fun stuff written all over it. Lisa - What an awesome boy card. There wouldn't be a boy in the world that wouldn't love this card. Lisa, I follow your blog and your feeds automatically come to me. I was really WOW'D by this card when it came in -- tri-shutter cards are so impressive anyway but this is done perfectly -- it's INK-CREDIBLE! Love the colors, the papers you've used and each panel -- unbelievable! How many ways are there to say fantastic ? What a great card. Love the stamp set. Your flags are such a great touch. Well OK then! This is definitely for a special boy! What a fantastic card! One he can keep on his dresser for at least a year! Love how you used the stamp set. Your tri-fold card is fabulous! Any boy (big or little) would be thrilled to receive it. Wow . . . Amazing; thank you for sharing! That card with a little truck could double as a prop at play. What an inventive mind you have. It is a super fun and ecellent project. This card is so fun!!! What little boy wouldn't love to receive it? Happy New Year! Such a lot of work...beautifully done....a card to be saved and displayed! Wow! What boy would not think this card is just amazing! So creatively designed! OMGoodness - It's a Card Castle!! And I love it, of course!! What a creative idea - and what a wonderful keepsake as well. OK I think one of my New Year's resolutions is to make one of these cards! I love this fold. Yours is absolutely amazing, I love all of the dimensional details you added. What a fantastic card!!! You certainly did justice to this great stamp set! I would love to try this fold with a card for my grandson! You added just the right texture and details! You are very talented! Amazing card. Lucky little boy to receive it. This is an absolutely fun filled card. It makes me feel as if I was at a monster truck pull at the county fair. What a fabulous card. I love it, and I'm sure the lucky young man to receive it will love it too. Happy New Year! Linda E.
Oh my, What an amazing tri shutter card! And the new stamps are awesome, I would love to win! what a super boy card this is. I love tri-folds and this has so many cute elements. Wow what an amazing card...any boy will love it. What a totally awesome card! The stamps alone are so cool, but the cuts and folds really make the card come alive! Your tri-shutter monster truck card is awesome! Wow! That is amazing! Fantastic work!! Wow this is totally awesome. Love the truck with the tread embossing folder combo. This card rocks. Lisa You have put a lot of work into this card, love it. 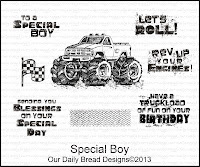 What an awesome special boy card. Love all the details. Lisa this card is spectacular, the colors, textures, and card shape work wonderfully together. Fantastic job! A truly special card and layout - WOW - fab paper, awesome stamps, you nailed this one with this design. Just lovely. Wow Lisa - this is so fun! I never know what to do with these cards - but you have nailed it. Great job .... kind of sad the boys are grown lots of really fun stuff out there for little ones these days .... but as you say - monster trucks, they can work for the older ones. I would love to give this card to the boys in my life. What an amazing take on this card fold! I love the turrets! Great job. This shutter card is totally awesome! You certainly hit it out of the ballpark! Your card is wonderful Lisa. My grandson would love it. He loves those monster trucks. The movement in tri shutter cards is perfect for kids! Totally fabulous! Such a great design with so many fun details like the banners and stars. Wow! Your card is amazing with all those folds. You are so creative! Happy New Year's! Wow, this is a fabulous card for a boy, love the details. What a fantastic card! Love it! I just ordered the diamond plate EF, can't wait for it to arrive! Thanks for sharing!! Fabulous, fabulous card. My five grandsons would LOVE it. (As I do!) Thanks for the inspiration. So cool!! What boy would not be excited to get such a card. Actually, those princess stamps would allow you to make a girly castle sort of card, too. Great job!! Way, way WAY too funnnnnnn!! LOVE the banners and design!! Super cool!! Fantastic, great colors and love the flags and the banner, great layout!